Christian formation and the development of faith values are essential to spiritual growth. Students must be nurtured to develop an active social conscience. Students have the right to learn and interact with one another in a safe and protected environment. Disciplinary policies applied fairly and consistently lead to self-awareness of social responsibility. Students should be challenged physically to enhance cognitive development and to encourage long-term good health and well-being. Our core curriculum must be grounded by real worked application of the principles of learning. Ongoing assessment and updating of curriculum is essential to our students’ academic success. Each student should have the opportunity to learn in the fashion which facilitates achievement of personal academic success. Effective communication among Administrators, Faculty members, students, and their parents or guardians, is the cornerstone upon which educational excellence is achieved. The diversity in our school community enables our children to understand, appreciate, and respect cultural and religious differences. Become global citizens willing to share their faith by modeling it and its values including participation in prayer, liturgies, and sacraments. Continue to seek knowledge and to evolve in the Catholic Christian faith so as to evaluate moral choices based on an understanding of Catholic teaching and values. See the benefits and demonstrate acceptance of diverse points of view so they may engage effectively within a diverse population. Fulfill civic responsibilities, volunteer to help others, and accept leadership roles to become self sufficient and work toward the betterment of society. Be a life-long learner who applies critical thinking and problem solving skills, time management, honesty, integrity, creativity, and ethical standards. Be able to evaluate the reliability and validity of digital information and is able to work efficiently and effectively in a technological world. 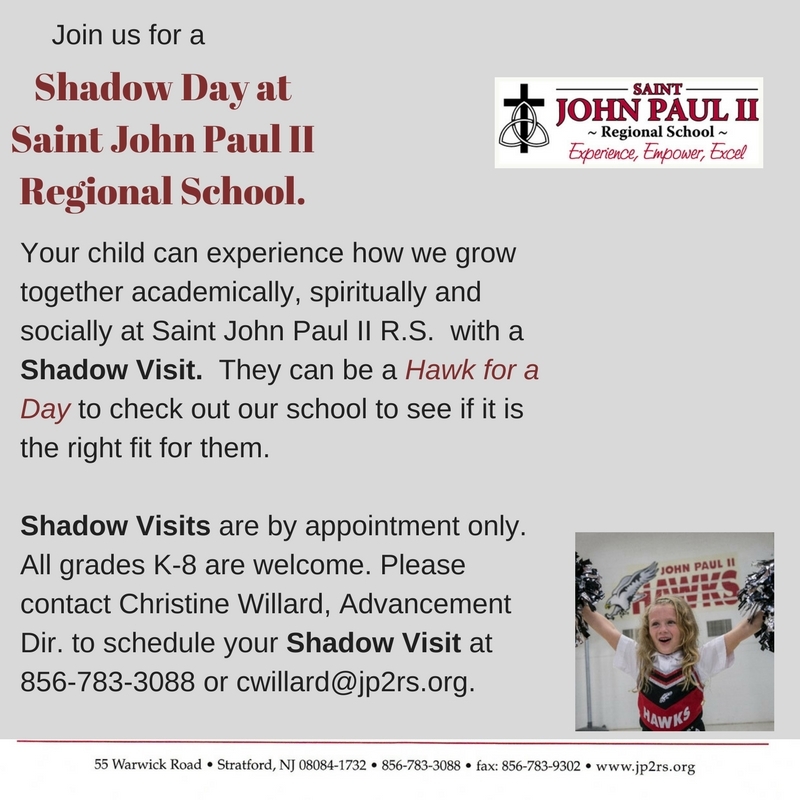 The St. John Paul II School experience develops each student’s mind, body, and spirit so they may contribute to a better society by helping others develop their abilities. We empower students to achieve their academic potential by recognizing student individuality, providing personal attention, and supporting teacher collaboration for continued success at every grade level. Our students excel in a community that affirms and honors our Catholic faith and traditions through prayer, service learning and honoring our school pledge: I believe that Jesus is present in each of my classmates and my teachers, and, therefore, my actions will show my respect for Jesus.